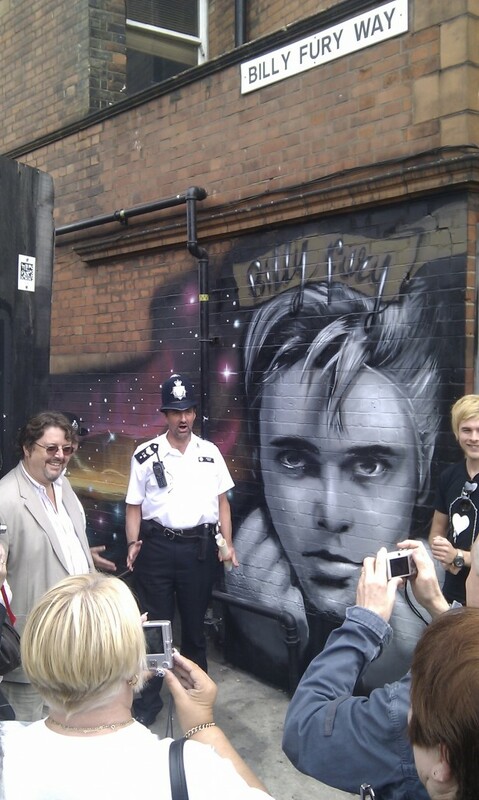 The path from West End Lane to Lithos Road was named Billy Fury Way last year following a poll. Billy Fury – one of Britain’s original rock & roll stars – recorded regularly at Decca Studios on Broadhurst Gardens. 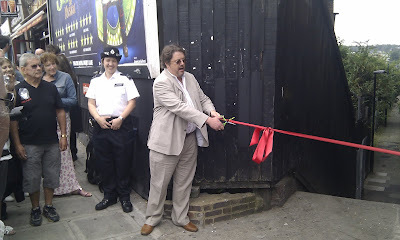 On Friday, the path was officially opened and a new mural was sprayed on at the West End Lane end of the path by graffiti events company Graffiti Life. As well as being a interesting visual addition to West End Lane, the idea is to spruce up this path and to encourage young people from the area to contribute more artworks along the whole path. I understand that Graffiti Life will be supporting this and working with the local community. Festivities began yesterday at 1pm with a song-title laden address in St James’ Church hall from Sgt Dave Timms, from West Hampstead’s Safer Neighbourhood Team. Odd? Well, not really – this is in fact an initiative driven by the police. Some of you will remember that one of the imperatives for naming paths such as this one and the Black Path was so the police could identify their location when chasing wrong-uns down these network of alleyways. It’s great to see real community support from our local police team who have similar plans for other parts of the footpath network. 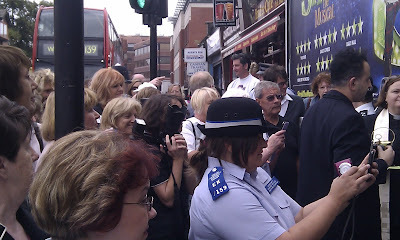 Some 40 or so Billy Fury fans came along – many of whom had travelled from all over the country – including Holly Johnson of 80s band Frankie Goes to Hollywood. 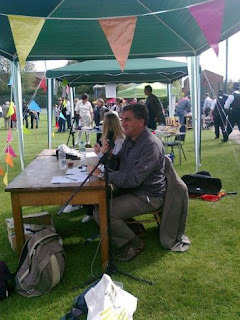 After a blessing of the site, councillor John Bryant who had driven the renaming exercise cut the ribbon. ShakeTastic took the opportunity of a crowd just outside to hand out free samples, while the police were spending half their time posing for photos and half stopping the traffic on West End Lane from mowing down ageing rock fans. The Safer Neighbourhoods Team also worked with Network Rail on the land it owns alongside Billy Fury Way, which included overhanging shrubs, hidden lighting and damaged fencing. Network Rail has undertaken a ‘deep-clean’ of one the most badly affected areas of litter and have re-fenced the area. Meanwhile, Camden’s Highways Engineering Team plans inspections and repairs to damaged pavement, and street cleaning contractors will clean these paths twice a week. The council will also start patrols to identify any irresponsible dog owners. Dog litter bins, as well as free standing regular litter bins, will be placed halfway along Billy Fury Way. PC Ruth Marshall, also from the Safer Neighbourhoods Team, said: “We want people to feel safe using Billy Fury Way. By keeping the area maintained, it will encourage the public to use it,” adding that the artwork was a “fitting tribute” to Billy Fury. There are more plans for more murals to celebrate the area’s musical heritage. Lets hope that this one sets a good precedent for the paths. Tom’s baffled by La Smorfia What have I missed since July 24th?